Often times I was and am still told I’m too harsh on my fellow Hokies. Chastising them for their poor behavior and reflection on the University when others would say, “they’re in college, take it easy, they’re supposed to have fun.” It must be because I have always held the reputation and name of Virginia Polytechnic Institute and State University in such high regard. “Having fun in college,” did not, in my opinion, excuse acts of stupidity or ignorance that were often fostered by alcohol or negative peer pressure. Many have told me that I’m just a grumpy old man, a party pooper who needs to ‘live’ a little more while I’m young and that I must’ve been forced to grow up too soon or something. That’s true, I have been forced to ‘grow up to soon’ and be mature and poised beyond my years. In fact, it’s happened more than once in my short life. And yes, one of those times is directly responsible for my disappointment in my fellow Hokies who chose/choose to goof off and poorly represent my beloved university– any day, but most especially on April 16th every year. Last year I wrote a reflection piece honoring those lives lost and forever changed by injury on April 16, 2007. This year my hope is to shed some light on why this day means so much to me from a perspective others may not and hopefully never will experience or understand. That’s me, a newly minted Virginia Tech Rescue Squad Team Leader with my back to you proudly displaying our logo, maneuvering the cot and prepping my crew. 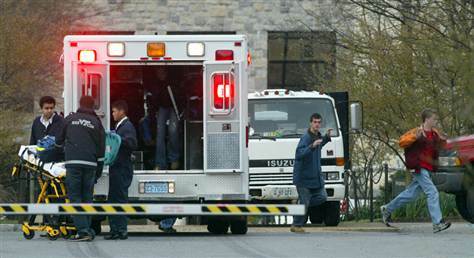 We were about to enter Norris Hall and become a few of the first medical personnel to enter the scene. My goals were to bring extra triage, bandaging, and life-saving equipment to the two VTRS officers already inside conducting triage assessments; extricate one or two wounded; and most importantly get my crew in and out safely and alive. I would spend the rest of that snowy, blustery April day [and night] in service to my fellow injured and fallen Hokies. Each of the following years the Hokie Nation would descend on Blacksburg for the anniversary and remembrance events. From the community picnic to the displays in Squires to therapy dogs and shows in Burruss the overwhelming support year after year never failed to arrive. I would try to make a few of these, but often spent the leading days preparing Incident Action Plans and staffing arrangements for candlelight ceremonies, speeches, and the like. Staffing those events on the days and then debriefing them in the days that followed. I share my experiences with you because I know, with the exception of my fellow VTRSers, everyone else experienced those days and events much differently. I don’t share them as a plea for pity; I willingly volunteered to serve, chose to be an officer & accept more responsibility, and decided to take on extra burdens so others could be relieved. I share them because, as much as this day and those that followed in the weeks, months, and years to come impacted everyone from students to faculty to community members to families and friends, I know there were things I saw and experienced others did not. Those experiences, and their resulting lasting memories, only sharpened my desire for all Hokies to always hold themselves to the highest standards and never settle for anything less than the best in life. We must always remember there are 32 angels who will never have those opportunities presented to you and me. They say that gobblers, shortly after birth, form sibling groups. These sibling groups are maintained for life. Even if all of a gobbler’s brothers are killed, he will not join another sibling group; they will always remain together until death. I’m sure Hokie Birds follow the same logic, they were after all once fighting gobblers. It makes sense that people talk in awe about the strength and strong community of the Hokie Nation. After all, as Hokies we are siblings for life. I would like to think had the events of April 16th never happened our bonds would be just as strong, close, and communal. I know for sure, that in their wake, our resolve was strengthened and it is why I hold my fellow Hokies to such high standards. Until next time, Ut Prosim! This entry was posted in Family & Friends, Life, The Pursuit of Happiness, Virginia Tech and tagged April 16, April 16th, Blacksburg, George W. Bush, GERMAN Club, Governor, Hokie Bird, Hokie Nation, Hokies, Nikki Giovanni, President, Tim Kaine, Virginia Tech, Virginia Tech Rescue Squad, VTRS. Bookmark the permalink. It is true that you are wiser than your years. You have been since a very young child. This molded you into the person you are. A very honorable, loving and caring man. Never apologize for that but stand tall and proud. Great post Jeremy. This makes me even more proud to join the Hokie nation.